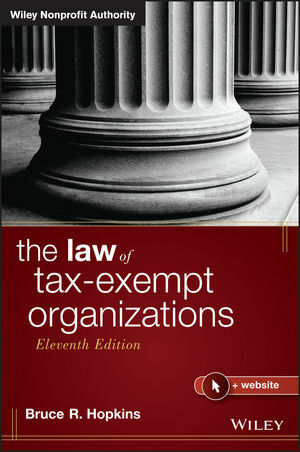 The Law of Tax-Exempt Organizations 11th edition details the complex set of statutes, regulations that govern this diverse category of organizations, IRS rulings, and court opinions. This new edition includes the most up-to-date coverage of subjects such as: nonprofit governance, and new rules for donor advised funds and supporting organizations, updates on unrelated business activities. Discussion of subjects such as the private inurement doctrine and private benefit doctrine have been expanded in light of recent IRS ruling activity. Written in plain English and supplemented annually, this book helps the lawyers and managers of tax-exempt organizations stay up to date on relevant law developments so they can make more informed decisions about their organization's actions and future direction. This eleventh edition is an important revision, with significant updates and vital information you need to know. Written by one of the country's leading authorities on the law surrounding tax-exempt organizations, this comprehensive and authoritative reference allows you to learn the particulars of the subject matter or get a quick refresher regarding specific rules of interest. For newcomers and experienced practitioners alike, The Law of Tax-Exempt Organizations 11th edition provides a single-volume resource for the latest, most up-to-date information aspects of the law. BRUCE R. HOPKINS is the principal with the Bruce R. Hopkins Law Firm, LLC. He is the Professor from Practice at the University of Kansas School of Law. He is also the author and coauthor of over 30 books, all published by Wiley, including Bruce R. Hopkins Nonprofit Law Dictionary and The Tax Law of Charitable Giving, Fifth Edition. Hopkins earned his juris doctorate and master of laws degrees at the George Washington University. He has practiced law for over forty-five years and is a member of the District of Columbia and Missouri bars. He received the 2007 Outstanding Nonprofit Lawyer Award (Vanguard Lifetime Achievement Award) from the American Bar Association, Section of Business Law, Committee on Nonprofit Corporations. He is listed in The Best Lawyers in America, Nonprofit Organizations/Charities Law, 20072015.